Yadi aap cricket me good interest rakhte hai to Dream11 Fantasy Cricket jarur khelna chahiye. Jisse aap maje ke sath prize money bhi win kar sakte hai. But aap win karne ke bad directally prize amount ko dream11 se withdraw nahi kar sakte. Jiske liye ek proper process hai. 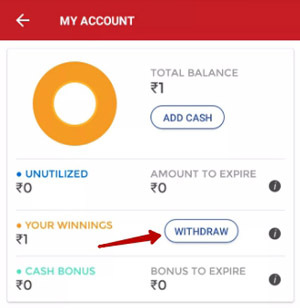 3.Cash bonus withdraw nahi kar sakte hai, keval winnings hi. 4.Ab withdrawal amount enter kare aur Withdraw Button par click kare. Ab 2-5 working days me aapke bank account me amount transfer ho jayega. 1.Kya dusre ke bank account me money transfer kar sakte hai? Nahi, aap ka bank account hona chahiye. Aise me yadi aap winning amount withdraw nahi kar pate hai to next month ke winning amount me add ho jayega. 2.Kya winnings withdraw karte time tax pay karna hoga? Ha, Dream11 vale Income Tax Act 1961 ke according wining amount ka 30.9% TDS deduct karke aapke bank account me transfer kar dega. Yah tax Rs 10,000 se jyada ke winning amount par applicable hai. 3.5 working days ke bad bhi bank account me winning amount transfer nahi hui? Aise situation me Dream11 support team se contact kare. 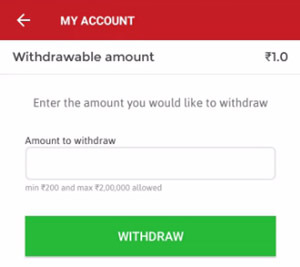 Dream11 account se winning amount withdraw karane ke liye a proper process follow karna padta hai, jise aap upar bataye gaye tutorial se samjh sakte hai aur easily apna amount transfer kar sakte hai. Yadi aap is post ko helpful pate hai to Facebook, Whatsapp and Twitter par share kare. Tab aap simple wait kare. Dream 11 wale jald aapke request par work karenge. Don’t worry, aapke request ke approval me kuch time lagega, jaise ki Dream 11 minimum 3 days leta hai. Merry winning cash withdrow nahi ho raha hair. Likh raha hai ki no withdrow are allowed in this app as par google’s policy. To aap dream11.com par visit kare. Tab aapko Dream11 ke support team se contact karana chahiye.